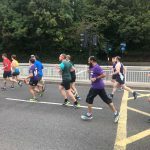 With so many races in the past year, the Sheffield 10K is embedded into my heart, mainly because of the reason of my first race last year. 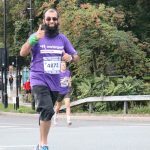 If you have read my previous posts, my running journey started towards raising money for Cancer Research UK due to my mother being diagnosed with Cancer. Fortunately, she is now well and has been cured. So, while I can race, I will be making the full effort of trying to make this race in the future. Also this year, I had persuaded 12 other members of my staff to join in running the Sheffield 10K in the Corporate Challenge. This also meant that we were given special t-shirts with our logo on the back and hospitality at the Crucible Theatre. How the challenge works, is that the top 3 racers from each company get chosen, get their aggregate times, and that is compared with the rest. So, it was a mini competition in a race. 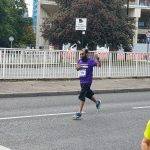 My performances over the year have been quite incredible and taking everything into consideration, I decided before the race to follow the 45min pacer and try to get a good PB. 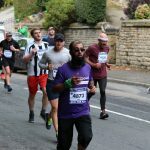 I had already calculated from Jack Daniel’s VdotO2 calculator that I should be able to achieve 45:41 considering my performance at Value of York HM, and also the great performance at Leeds 10K a couple of months back. 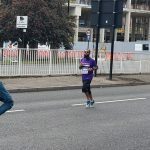 I started right beside the 45 min and realised how far ahead I was compared to the pen I was in last year. This really felt quite daunting, and nerve-racking. I never imagined that I could be so close to the front-runners. The race started on time and I managed to steadily keep up with the 45 min pacer from the beginning. The buzz and the noise from the crowd were amazing at the beginning, and this carried me towards mile 1. At this point, the pacer was well within reach. However, my breathing got heavier and the legs seemed to suggest that I was over-working them. Looking at my watch, it suggested that the pace was going towards 43 minutes for the 10K. It probably showed that the pacer, as well as myself, started a bit quicker than we should of. I think the lesson learnt here is, to pace yourself, and do what is more comfortable for you, and don’t think what other people are doing. So, although I didn’t think at the time, it was just damage limitation time, I had to slow down and recuperate. I think, mile 3 was the hardest for me in this race, and I really wanted to stop and walk up the hill past Endcliffe Park. I’d never thought, that would feel like this in any race, as I was always feeling pretty amazing in the races over the past 4 months. Fortunately, I just battled through, and just thought about steadily going through and try the hardest you can. So many people in the race passed me but I couldn’t gather the energy to try and compete, even though we were going downhill. It was also apparent from my watch too, as that was showing my ETA slowly increasing too. I knew from this, that my fantastic run of PBs will end today, so tried to just enjoy the race, and get to the finish line. After coming over the line, and within 20 seconds saw my result of 47:52, which is now my 3rd best time. I think considering the season I’ve had this was still a fantastic time, and there will be some races that you won’t do well. I think, after contemplation, I may have made at least one mistake that was to run 13 miles a few days earlier. Need to learn to take it easy and prepare for races a bit better. So until the next race, and if everything goes to plan, you’ll see me back again on the 14th October at the Manchester Half Marathon. I am hoping that I can get close to 1 hour 40 which is being predicted by one of my strider friends.